Moonlighter, Digital Sun and 11 bit studios’ indie gem, reached a major milestone by exceeding 500,000 copies sold across all platforms! To celebrate the game’s success, the teams have unveiled their plans to release a paid expansion, dubbed Between Dimensions, due to release Summer 2019. Touted as the “biggest expansion so far”, the DLC will treat players to 10 new creatures infesting current dungeons and a brand new Interdimensional Dungeon with 5 new mini-bosses! New items, weapon set, armour set, rings, shop upgrades, and even new visitors to the village of Rynoka are also planned! Get ready to master the all-new Trick Weapons as well, which give Will special powers but punish novice use. If you thought that was enough to keep you satisfied, think again! Digital Sun and 11 bit studios are also cranking away at a mobile port of Moonlighter! This port is stated to be a reimagining of the game with new mechanics, redesigned levels, and redesigned controls. The mobile port is also slated for 2019. Moonlighter is a rogue-lite action RPG title telling the story of a dreaming shopkeeper named Will who wishes to be a hero. In the village of Rynoka, keep your shop in business while visiting the archaeological excavation site to pilfer much needed stock from the dungeons that lie within! Collect loot throughout your travels, craft new armour and weapons, mingle with the townsfolk, and embark on quests through dungeons infested with various enemies! 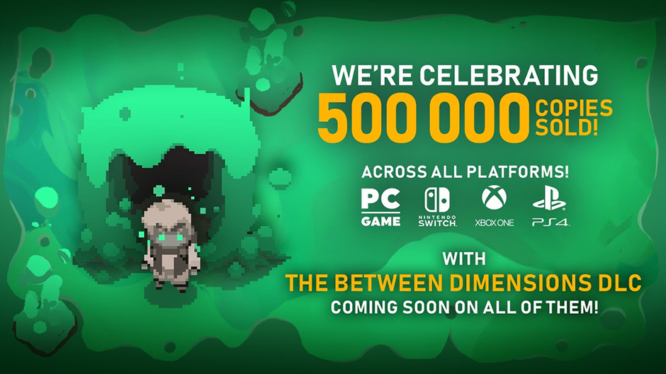 There is no better way to celebrate this milestone than new content and a new port, so get ready to embark on a deeper adventure when the Between Dimensions DLC launches Summer 2019, and the mobile port of Moonlighter slated for this year!